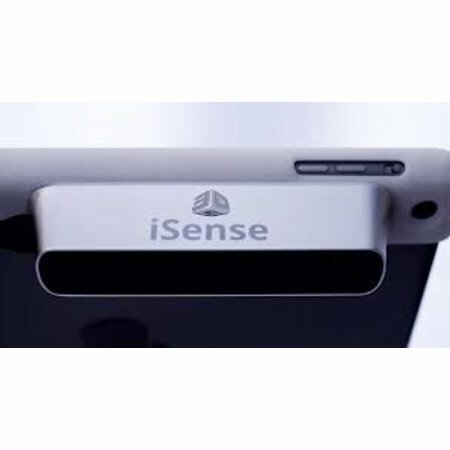 The iSense 3D Scanner from 3D Systems snaps onto your iPad 4th Generation, transforming it into a 3D scanner that allows you to capture images in three dimensions right from your device. Optimized settings allow you to effectively capture objects of all sizes, up to full bodies and scenes as large as 10 feet tall and wide. 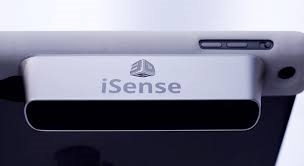 The iSense was engineered for indoor use, as bright sunlight can reduce the quality of the scanned images. The scanner can also operate in complete darkness, although it will not be able to capture any color data. The iSense will work optimally at a distance of 1.7 to 4.2' from the target object, although the full operating range is 16" to 11.5'. Closer objects will be scanned with more detail than objects further away, and if you get too close to your object, your screen will turn white, alerting you that the iSense is unable to capture any image information. The iSense features customizable settings, a versatile scan range and scan volume, and automatic object recognition. Together with a variety of editing tools, you will have all you need to capture your object, adjust it, prepare a 3D file, and upload it to your 3D printer for creation. To operate the scanner from your iPad, download the free iSense app from Cubify.com. This app provides you with a variety of editing tools that will help you crop, enhance, and solidify your scans, and prepare them for printing. Afterwards, upload them straight to your Cube printer from home, or send them via cloud printing from wherever you happen to be. Included with the iSense are a bracket that will fit the scanner firmly onto your iPad 4th Generation, a battery charger, and a cable that transfers your data from the scanner to the iPad. Get Started Right Out of the Box Download the free iSense app from Cubify.com, snap the bracket onto your iPad, and plug one end of the included cable into the iSense and the other end into the micro-USB port on your iPad. Just hold your iPad about 20" to 5' from your target and capture your image. Infrared Technology Using an infrared Class I laser projector, the iSense projects a pattern onto the surroundings that is invisible to the naked eye. Its safety is ensured by included hardware and firmware mechanisms that monitor the laser and shut it down in the event of the slightest fault. Automatic Object Recognition The iSense 3D scanner extracts precise targets from busy backgrounds, allowing you to zero in on the objects you want to capture. Toggle Settings iSense software allows you to select and modify scan settings specifying object size, resolution, color, frame rate, object recognition, and more. Editing Tools The cropping, enhancement, and solidifying tools on the iSense app help you prepare 3D printable files right from your iPad. For further manipulation, export your file to one of Cubify's CAD software programs, such as Cubify Sculpt. Compatibility for Easy Printing The iSense is fully integrated with Cubify.com and your Cube 3D printer, which means you can upload scans directly for 3D printing, both at home, and via cloud printing from wherever you happen to be.